(Discworld: Wee Free Men / Hat Full of Sky) I Will do two separate posts. Incipient witch Tiffany Aching, who confronted danger in The Wee Free Men (2003), faces even greater peril in this equally quirky sequel. 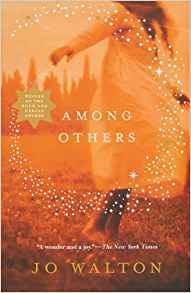 She is taken on as an apprentice witch by Miss Level, who is one person with two bodies--an oddity to say the least. Also, Tiffany is stalked and taken over by a hiver, an invisible, brainless entity that commands and distorts the mind of its host, which eventually dies. Luckily Tiffany is strong enough to hide a section of her mind within herself, but she is otherwise completely under the control of the hiver. It's the cantankerous Wee Free Men (or the Nac Mac Feegle) to the rescue, with the help of Miss Level and the wisest, most respected witch of all. The chase is part slapstick, part terror, and in the end, Tiffany herself sets things straight. 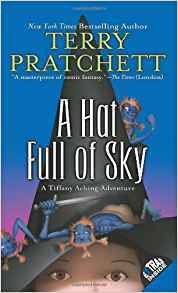 Pratchett maintains the momentum of the first book, and fans will relish the further adventures of the "big wee hag," as Tiffany is known to the Feegles. This is a case of the story improving as it goes along. Or maybe it just wasn't confusing like the dream in dreams of book one. In A Hatful of Sky Tiffany goes off to learn more about being a Witch. She isn't gone long when the Nac Mac Feegle's have come to help her once again since they, first sense, and then know, she needs their help. At the beginning of the book is a Feegle glossary. This is the part where we learn new words ..
Hag: A witch of any age. In this book Tiffany learns how to tolerate, and help, those that most would feel do not deserve her help. To sum it up.. this book has adventure, learning, and a number of smiles along the way to keep anyone content. An enjoyable read. Now on to book three: Wintersmith. 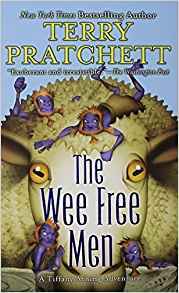 Since the book "Wee Free Men: The Beginning" holds two books in one, it will seem that I post on the book twice (which I will!). I have finished the first "book" in a book: Wee Free Men. Nine year old Tiffany Aching thinks she is becoming a witch! After meeting the (very blue, kilt wearing) wee free men she goes on a quest to rescue her little brother who has been stolen by the Queen of the fairies. And what is her choice of "weapons" you may ask.. go ahead... ASK!... ok I'll tell you... it's a frying pan! That made me smile. Any woman knows a frying pan is a darn good weapon to wallop someone with! While trying to find her brother, Tiffany finds herself in a dream, and then a dream within a dream, and has to figure out how to get her brother and get out of the dream before the Queen has her in her power. She also finds out that not all dreams are good dreams..there are also nightmares! With a deft hand and a blazing imagination, fantasy writer Walton mixes genres to great effect. Elements of fantasy, science fiction, and coming-of-age novels combine into one superlative literary package that will appeal to a variety of readers across age levels. After engaging in a classic good-magic-versus-bad-magic battle with her mother that fatally wounds her twin sister, 15-year-old Morwenna leaves Wales and attempts to reconnect with her estranged father. She was sent to boarding school in England, and her riveting backstory unfolds gradually as she records her thoughts, feelings, and experiences in a series of journal entries. An ominous sense of disquiet permeates the nonlinear plot as Morwenna attempts to avoid a final clash with her mother. 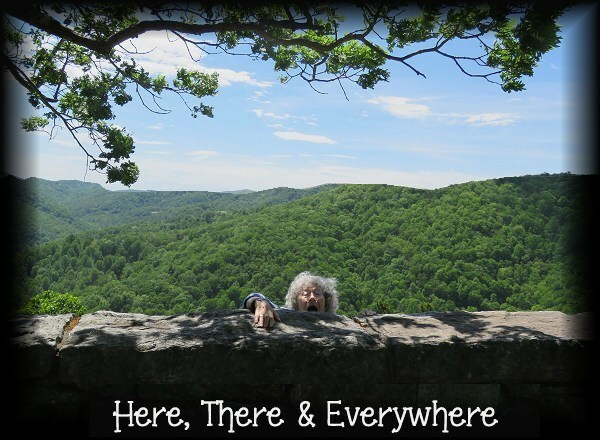 In addition to casting an irresistible narrative spell, Walton also pays tribute to a host of science-fiction masters as she peppers Morwenna’s journal with the titles of the novels she devours in her book-fueled quest for self-discovery. O'm'gosh! I don't know where to begin, except to say I won this book from Carl over at Stainless Steel Rat, and now I can't begin to thank him! And since I don't know where to begin to tell about the book, here's the link to Carl's review, since he, so obviously should be a book critic anyway! As most of you know, I don't read sci-fi. and this book mentions "tons" of sci-fi book titles and refers to them, but even so, I had no trouble what-so-ever enjoying this book! As Carl had pointed out in his review Mori also mentions the Pern books a number of times and Stephen Donaldson's books . . all of which I have read. Both of those sets of books would be correctly referred to as sci-fi (slash) fantasy.. with the emphasis on fantasy. I did love how the book was formatted to be entries into Mori's journal. I've read a few other books done similar and enjoyed them also. I did, at times almost forget she was only 15 yrs old because he writing was so well done... but then she was so well read, I guess I should expect that. Mori's life, up to this age, was somewhat of a turmoil. Her parents were divorced, and due to her mother, her twin sister was dead and she herself had an on going leg problem. I easily related to the divorced parents, and due to my reading habits now that I am old, I could relate to the enjoyment she received from reading and from being able to share that enjoyment with others.. had she been born a bit later I am sure she would be in our little community of book bloggers! I have to say, I wish this book were longer. And to be honest, Jo Walton "could" continue her story as she continues in school! If she ever should decide to write more about Mori I will certainly purchase the book! I wish I had the "words" like Mori did and like Carl does when he talks about an extremely enjoyable book.. but alas.. I can only say, "this one is a keeper!" And hope that you decided for yourself to find this book and give it a go for yourself. Here are some tidbits from the book itself... just to entice you! "I did not buy Lord Foul's Bane by Stephen Donaldson which has the temerity to compare itself, on the front cover, to "Tolkien at his best". The back cover attributes the quote to the Washington Post, a newspaper whose quotations will always damn a book for me from now on. How dare they? And how dare they publishers? It isn't a comparison anyone could make, except to say, "Compared to Tolkien at his best, this is dross..."
"What is it with me and Anne McCaffrey and getting the second book first? Dragonsinger is the sequel to something I've never seen called Dragonsong! I read it anyway. It's set in Pern, rather than being about Pern, if that makes sense. I would like a fire-lizard. Or a dragon, for that matter. I'd come swooping in on my blue dragon and she'd breathe fire and burn down the school!" "Bibliotropic", Hugh said, "Like sunflowers are heliotropic, they naturally turn towards the sun. We naturally turn towards the bookshop." "The acupuncture went well. It turned the pain off entirely while I was on the table. That's marvelous, it's just so nice not to have any pain at all, not grinding away in the background even, just no pain. I lived like that for years, but it's hard to remember. Pain oozes. Like my dream with the ballerina with the walking stick." 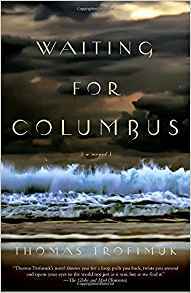 Waiting for Columbus by Thomas Trofimuk. Canadian writer Trofimuk's uneven novel begins with an inspired premise: a man claiming to be Christopher Columbus shows up at an insane asylum in contemporary Spain. Under the care of a nurse named Consuela, he begins to tell stories of Columbus's adventures, remembering some and reliving others. Meanwhile, Interpol declares the mystery man officially suspicious and dispatches an agent specializing in cold trails to track him down. How can I say that the book did not "grab me and become something I couldn't put down"..and yet... I found that I wanted to continue to read it. The book is about a man who is in an asylum claiming to be Christopher Columbus. I thought the premise was quite interesting and so sent for the book from Amazon. The story itself was actually quite good. I found myself with many questions. Why Columbus? Why were his stories in the past and little things in the "now"? What would happen when he finished his stories? I have to say I think the book had a little more potential than it had, and sadly, I was disappointed in the ending. No, endings don't have to happen "happily ever after".. I guess I wanted to know more about what happens to Columbus. Overall, it's quite an interesting story. 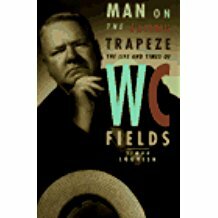 Man on the Flying Trapeze: The Life and Times of W.C. Fields by Simon Louvish. The first serious biography of the legendary comedian in nearly 50 years, and one worthy of its hero. Even people who have never seen a W.C. Fields film probably know him as a man who loved to drink and hated dogs and children. Most likely, they would assume that the onscreen character and the offscreen man were one and the same. But Louvish, in his lively biography, delves beneath the surface and discovers an artist who carefully built this character as a comic construct. The real Fields had nothing against dogs, and, yes, even enjoyed the company of children. (The drinking, however, was authentic.) Louvish, who teaches at the London International Film School, is clearly a Fields fan, and this lends his book a warmth uncommon in show- business biographies. He aims the book at his fellow fans, and uses a chatty, conversational tone: sharing stories and trading opinions and favorite gags over some Fieldsian libation. But the tone doesn't hide the exceptional research he has done. He vividly paints the details of Fields's life and the vaudeville, film, and radio worlds he moved in. Most importantly, in extensively describing Fields's early career, he presents the classic films not as the solitary miracles they appear to be, but as the culmination of an extensive career that saw Fields a major star on the world stage as early as the turn of the century. Louvish is also a novelist (The Silencer, 1993), and in the book's coda (in which he imagines Fields entering heaven and greeting his vaudevillean friends), he demonstrates that even the hokiest of concepts can be moving when presented with passion and commitment. He concludes with a brief but sharply perceived analytical afterword. At last ``the Great Man'' (as Fields called himself, accurately) has a great biography. Ok, I know, I know... I read things no one else wants to read, but I can't help it when it comes to Simon Louvish, he's just a phenomenal author. W.C. Fields is not an all time favorite actor of mine, although when I was young and his movies played on tv I did see a number of them. But Simon Louvish must have a love affair with that era because in his Biographies he manages to make you feel you are there and that you know the person he is writing about. I think W.C. was an all time favorite of Louvish's. It's a long book and I will admit there were times I felt it got "long in the tooth" because he would put in *verbatim*, parts of Fields's dialogues in his movies or stage appearances, and that part didn't hold my attention as much as the rest of the book. Still, I find him a compelling author . "Duffy and Sweeney are drinking steadily at a bar, until suddenly, without warning, Sweeney keels over on the floor. Duffy, without batting an eye, continued to swig his drink, commenting: I like a man who knows when to stop." Here is where I tell you that other than his heavy drinking, much of what one thinks they know about W.C. Fields is probably wrong. ..a paragraph on page 181..
Nearly all of my successful songs have been based on the idea that I am getting the worst of it. I am the "Jonah Man," the man who, even if it rained soup, would be found with a fork in his hand and no spoon in sight, the man whose fighting relatives come to visit him and whose head is always dented by the furniture they throw at each other... Troubles are only funny when you pin them to one particular individual. And that individual, the fellow who is the goat, must be the man who is singing the song or telling the story. "Congress is so strange. A man gets up to speak and says nothin'. Nobody listens. Then everybody disagrees. or "Don't worry if a man kicks you from behind, it only proves you're ahead of him". ... page 390... talking about his part in David Copperfield. Playing a beloved classic, the irascible Fields was a veritable lamb in the hands of director George Cukor. A number of ad-lib scenes involving high jinks with a bathroom razor were apparently filmed, but lost in the cutting room. Fields was working among some of the best talent in Hollywood, Lionel Barrymore, Elsa Lanchester, Basil Rathbone and Roland Young as the definitively 'umble Uriah Heep, although his own scenes were pretty self-contained and completed in about ten days. ... a tidbit about the man himself.. page 410.. Here he returned to his hobby of gardening, with particular attention to flowers, his passion for which he was at great pains to hide from posterity. At a later date Gene Fowler would chronicle his occasional habit of sticking notes addressed to his rosebushes on his personal billboard: "Bloom, you bastards! Bloom!" For whatever reason Louvish's Biographies are always long! lol.. but in the end, I'm always glad for it. He is surely an author I have to admit to enjoying over and over again. I have certainly found that: if you like the era you will like his biographies!